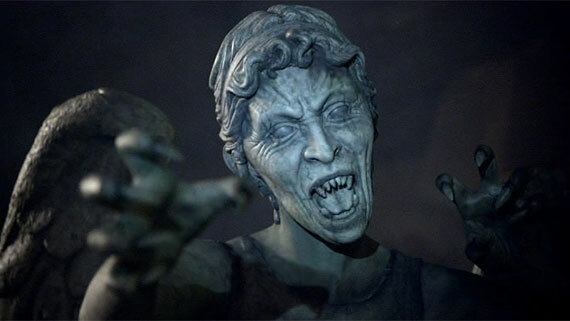 Abilities: There are only ever six Weeping Angels in existence, and they all seem to share a link between them; communicating telepatically whenever a threat comes into their scope of vision. As soon as one is to approach the central palace of the Darkroot Domain, a message is sent between the six Angels from the centre: 'Threat Detected.' That said, it only rouses them from their sleep--they're still unable to do anything but stay still. It is not until the large reflective domes that are placed before each of the Angels are opened up that they are given free reign to do as they wish with the target(s). In appearance, the Angels are about the height of your average female human, with supposedly human-looking faces that are almost always covered by their hands--this gives them the appearance of crying. Their bodies, when they are seen, are completely made of an unbreakable marble--it can be eroded by the elements over time, but striking it with any sort of object will do nothing but emit a powerful ringing noise that can actually attract the other Angels to your position. What makes these 'Angel Statues' unique, however, are their two fundamental powers. Firstly, not even Ba'al knows what form they take. That is because as long as they are perceived by any being, the Angels' automatic defense mechanism kicks in, and they take the form of statues, crying into their hands. This defense mechanism automatically locks them into the statue form the moment they realize they're being looked at. Although this makes them completely invulnerable, it also leaves them unable to move. This also invites what is quite possibly the easiest--and maybe even only--way to beat the Angels completely. If exposed to either a reflection of themselves, or the gaze of another Angel, they will be locked into their statue forms until either the reflection is shattered, or something is placed between the two Angels that blocks any and all vision. This also makes their grip nigh-impossible to escape from. Secondly, they have an ability that can make even the simplest trips into Inferis extremely complicated within moments. If they get their hands on you, you will suddenly find yourself in another place in Inferis. Not just another part of the Darkroot Domain--you could find yourself in a completely different sphere entirely. With enough bad luck, you could find yourself sitting right in front of Lucifer's throne, on one of his... bad days. The energy produced by your body teleporting such a distance is what they feed upon, and what they so gloriously seek. Their sight range is limited to short distances, but they have a 'sixth sense' that alerts them to someone watching them. They are far less likely to try and take on a group of Demon Hunters, instead watching and waiting for one of them to be separated from the group; whittling them down to nothing with a patience that can only be seen coming from a statue. Miscellaneous Notes: Don't blink. Blink and you're dead. They are fast. Faster than you can believe. Don't turn your back. Don't look away. And don't blink. Good Luck.